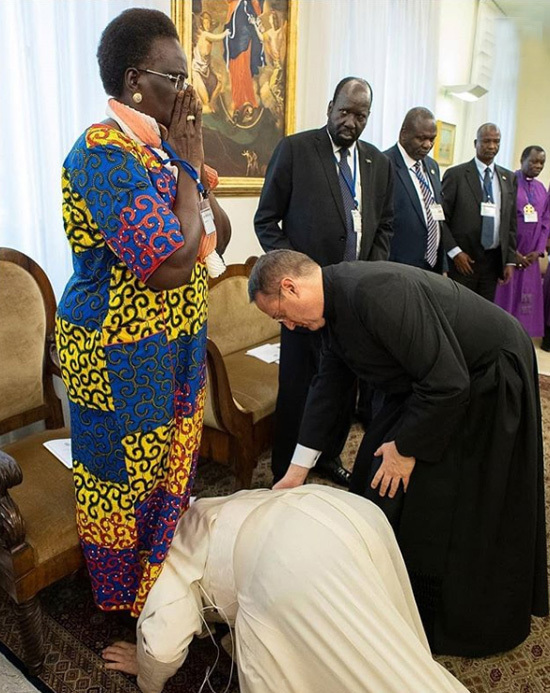 On April 11, 2019, at the end of a two-day spiritual retreat at the Vatican for the political and spiritual authorities of South Sudan, Pope Francis kissed the feet of its future president and three vice-presidents – a woman and two men. The future governemnt will be inaugurated on May 12 and is composed of the president Salva Kiir, below first row, vice-president and present day opposition leader Rieck Machar, second row, vice-president Taban Deng Gai, third row, and Rebecca Garang, above. 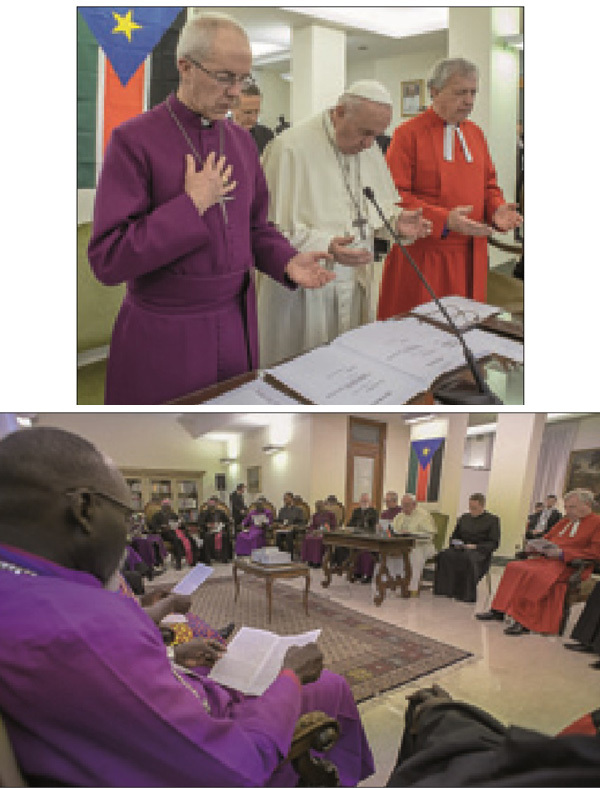 The retreat was a joint ecumenical initiative of the Vatican Secretary of State, the Anglicans from England, and the Presbyterians from Scotland. Scenes from the final session can be seen in the two last rows. 4. It is also in contradiction with his recent refusal to receive the homage of Catholics in Loreto who wanted to kiss his hand. On that occasion he alleged that he withdrew his hand in order to avoid germs; now he kisses the shoes of persons without any special sanitary concern. In conclusion, it is one more theatrical act trying to destroy the Papacy by an undignified and disgusting act that can only be explained when we considered the hatred Progressivism has for this divinely established Institution.